It was imported into Europe in the sixteenth century. William Turner, an herbalist of the time, gave it the name "holyoke" from which the English name derives. For maximum freshness, please keep seed refrigerated in its original packaging until it is time to plant. To grow as annuals sow seed in containers at 13ºC (55ºF) in late winter. 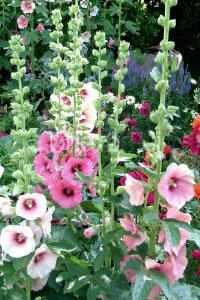 To grow as perennials, sow in the garden in late spring, early summer. Grow in moderately fertile, well drained soil in full sun. Staking is a good idea anywhere wind might be a problem.